Facebook continues to introduce new ways for page administrators to monitor their competitors’ pages, following up the addition of Pages to Watch to its page insights earlier this week with the introduction of notices when posts from those pages are generating strong engagement. New post to watch: A page you watch has a post that’s getting a lot of attention. A “view post” button also appears at the bottom of the module. 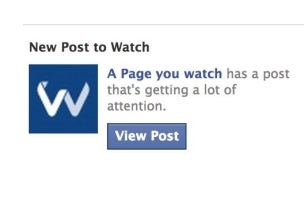 Page admins: Have you used Facebook’s Pages to Watch feature?